This article ran in the Summer 2015 issue, alongside Cycles of Change. Angela Bischoff smiles fondly as she recalls how the late Tooker Gomberg, former City Councillor and her longtime partner, triggered the original pilot for bike racks on Edmonton transit buses. The story epitomizes how Gomberg would sacrifice himself to a cause. He was restless and rarely looked back. “Tooker was always pushing his agenda,” says Bischoff. His methods could be controversial—he famously refused to wear a tie at council meetings, and he once locked himself in a vault in Ralph Klein’s office and faxed out media releases on Klein’s own letterhead. But he was a dedicated activist who sought creative ways to push for causes he believed in. On Edmonton City Council, he advocated for environmental improvements beyond the Bicycle Transportation Plan and into waste management and recycling initiatives. 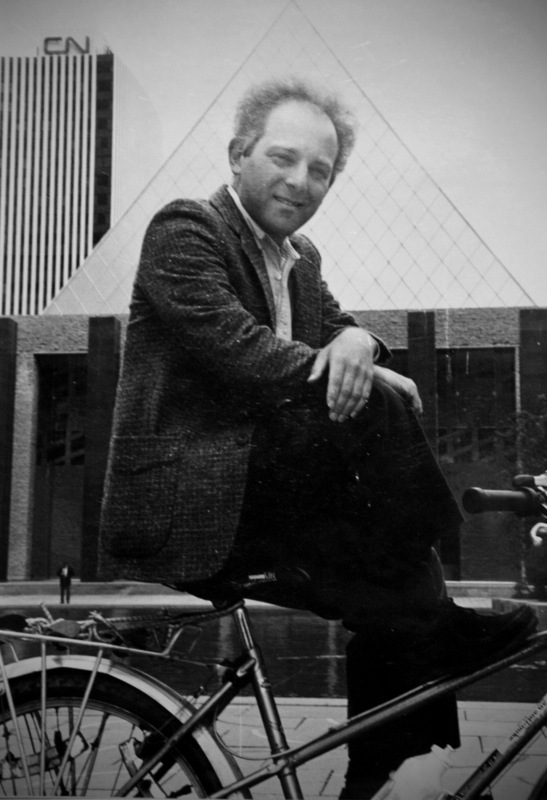 Gomberg eventually moved to Toronto and continued his activism. However, his restless advocacy took its toll and he was overcome with severe depression. After his anti-depressants stopped working, his doctor increased his dosages—despite side-effect warnings—but his demons continued haunting him. Gomberg’s bicycle, helmet and a suicide note were discovered on the MacDonald Bridge in Halifax in 2004. His body was never found. He was 48. Bischoff continues to work in the environmental movement in Ontario. Jeremy Derksen is a former bike courier whose penchant for adventure informs his work, whether it be as a magazine writer, location manager for Alberta film crews or former newspaper publisher. This entry was posted in 2015 Summer, Extraordinary Neighbours.